with a great Thank You to Michael Parziale ([email protected]) who did a fantastic work making these videos! For the Engine Bay Lighting System, we designed now a specific heat resistant rubber shield in which the lights are inserted. Not only this shield absorbs the engine vibrations, it also directs the light only towards the engine and not through the window. From outside, the lights are invisible, even when turned off! To allow the window or this engine bay area to be cleaned, the Engine Bay Lights are removable thanks to a clever fastener system. This solution integrates in your Ferrari as it was made stock! Some pictures of our product parts. 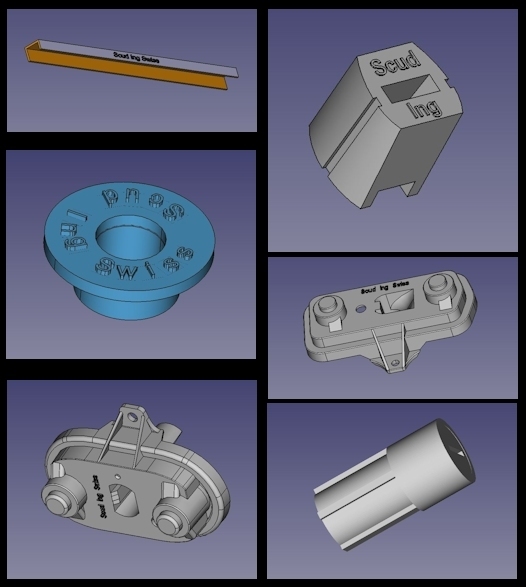 We design all our own parts up to the smallest grommet. From each specifically made high precision injection mold, come out our parts which are manufactured with the best materials. All our products are designed from scratch, part by part including our electronic boards. This makes our products exclusive, unique and of very high quality. We designed a new optical lens to improve even more our Ferrari LED Rear Light solutions. This lens required a lot of research and serious investments but we succeeded to magnify and distort simultaneously the LED light source to obtain as a result a very bright light but without any spots with the light filling up the entire rear light cluster, much better than an incandescent light bulb does. By upgrading your Ferrari rear lights with our high tech solutions, you'll considerably improve your safety and the reliability of the stock lights! Our LED rear light solutions are getting even better, we believe we achieved now the absolute perfection of these products! Our new LED light Lens in action! The micro-lens optical design (Micro Lens Array) of our new lens uses inverted hemisphere micro-lenses that are positioned in a hexagonal array for the best possible glare control and diffuse light in all directions. Combined with a specific plano-convex lens and its optimized focal length, the light is considerably magnified and allows a perfect beam angle control. These pictures demonstrate the powerful red glare generated by our own manufactured red LED lights combined with the new lens. There aren't any visible "LED hot spots" anymore which makes our LED lights unique on the market. As a result, the rear light clusters are entirely filled up with a powerful red light well more visible than any other LED or incandescent bulbs. In addition to the aesthetics, our LED lights are a considerable safety improvement with an 100% total illumination response time of less than 5 milliseconds! Thanks to our micro-processor based DRL Lighting Control Module, our DRL lights, stock rear parking lights or ILUAL43 LED Rear Lights as well as our Engine Bay Lighting System will be powered automatically when the engine starts and stops. The Night Vision feature will leave these lights on during 60 seconds after the engine has been stopped. The lights will turn on and off with a soft fade in/out effect. NEW: This complete new version of the module is now compatible with the stock taillights! It also comes with a remote control unit to turn on the lights at distance when the car is closed. With one short press on the "A" button, all the lights will immediately turn on, then after 1 minute, they will automatically turn off with a soft fade-out effect. Complete new design of our electronic board and new developed firmware. The module is a pure electronic device 100% engineered by us and doesn't use any relays or mechanical components to power the lights. NEW: we've now launched also the 'Stock Lights' version of the ILUAL36 LED Rear Light System which will light up the rear lights just like the original lights but in a much better and safer way. This 'economical version' uses still the same high profile technology as the 'Full Lights version = parking/stop lights illuminate all 4 rear light clusters' and is a complete solution that contains 4 complete bulb holders, 1 flasher relay and 2 front turn signal SHP LED Lights. All SHP LED lamps come also with our bright new optical diffuser lens! This picture was taken by a USA F430 owner and compares the stock light (left) vs DRL Light - Ultimate version (right). While it's impossible to capture the strong brightness of the DRL Light with a digital camera, the difference is incomparable. 100% Plug & Play and very easy to install. These DRL Lights will dim by half when the low beam lights are turned on to avoid blinding other drivers at night. This is not a simple LED strip but the results of several years research in automotive lighting. They are made to last forever at 100% of their original capacity. Look around, there is a good chance you'll see a F430, Scuderia or 16M with these Ultimate DRL Lights as many have already upgraded their lights. Combined with the DRL ECU Module, the DRL Lights will turn on automatically when the engine starts and turn off after 1 min. when the engine is stopped. You can also turn them on with the provided remote control unit at far distance, even when the car is closed, something very much appreciated by the owners. They will then turn off automatically after 1 min. with a soft fade-out. Engine stopped, a simple press on the "P" button will turn them on during 1 minute. The micro-processor based ECU Module is 100% Plug & Play and interfaces directly with the car without any modifications. The ECU module is entirely compatible with all the other light switches. It's also 100% reversible, unplug it and the F430 becomes again as stock. I would like to say a big thank you to Stefan and his company - the mark of a good company is how they handle it when things go wrong. I will say Scud ing Swiss are the best. My interior lights which I bought from Stefan about 1.5 years ago went on the blink. I e-mailed Stefan and explained the problem. He promptly replied, asked for photos which I sent. He knew what was wrong and said he would send me the latest version of the lights for free which I have since installed on the car and they are excellent. After seeing the difference in light quality from the old LED bars to the new ones which were made in house by Stefan and his team I will be upgrading to his new DRL lights in the near future. Thank you once more Stefan - you have great products and more importantly you have excellent customer care. Many thanks Tom for your post, very much appreciated! I'm very glad that you like the new Interior Lighting System in your F430. Since end 2015, we designed and developed each individual part of our solutions, from end to end, which give us now entire control on each part including the LED bars. We're restless about quality and perfection! Still awaiting a solution for the 308? Hi @Crowndog , what solution would you like to see coming for the 308? LED Rear lights? DRL lights? With the micro-processor based Plug & Play DRL ECU DUO Lighting Control Module, the HID low beam lights AND the DRL lights will be powered automatically when the engine starts and stops. The Night Vision feature will leave only the DRL lights on during 60 seconds after the engine has been stopped (and not the HIDs which turn off immediately to save power). The DRL lights will always turn on and off with a soft fade in/out effect. This solution comes also with a remote control unit to turn on the DRL lights at distance when the car is closed or at any time. With one short press on the "A" button, and only the DRL lights will immediately turn on, then after 1 minute, they will automatically turn off with a soft fade-out effect. Same result with the "P" button located on the center console, press and depress this button and the DRL lights will stay on for 1 minute. And of course, you always keep control on your lights as this system will take in consideration your intentions when you manually turn on/off the vehicle lights. Rear light bulbs for the 308. Reverse, stop and blinker, running as well.